Featuring rolling wheels, you can easily move Weber One-Touch Gold Kettle Grill to your cooking place. The grill includes 22.5-inch diameter porcelain-enameled bowl and lid with a cooking area of 363 square inch to provide for ample space to cook good quality food. The One-Touch cleaning system is aluminized, to prevent any coating damage, and comes with a high capacity removable aluminum ash catcher for quick and easy cleaning. The damper is also aluminized to be rust resistant. The glass-reinforced nylon handle with tool hooks doesn’t heat up to avoid any burns. The final assembly dimensions are 38.5-inch by 27-inch by 22.5-inch. The grill provides the users with extra large area for cooking, so you can cook for many people and save time and still maintain good quality. Air vents and damper have high precision so that you can regulate and maintain the temperature inside the grill to be exactly what you want it to be to cook perfect food. Easy assembly, no fire shoot ups and easy maneuvering make the grill highly proficient. The grill has a very high quality construction and is built well for longer grilling life and to be free of rust and damages. One-Touch cleaning system and removable ash catcher save the users from creating a mess while cleaning out the ash and is totally hassle free. You can easily monitor the temperature inside the grill by a lid mounted thermometer. Some users might experience that wheels don’t have a smooth movement and you might have to drag the grill. If the movement gets too rough, the tri-rods might even come off. There might be some problems with packaging. If the porcelain finish gets damaged, the grill might get rusted ad corroded with the passage of time. The ash catcher may not meet every user’s requirement. It might seem small to catch enough ash. Installing it might also be a problem as the manual has lots of illustrations but little written directives. 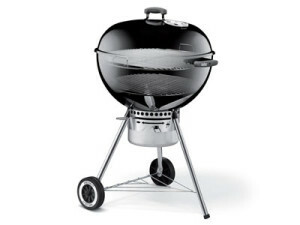 The grill is highly recommended for individuals who want a super sized charcoal grill, with additional in built features to help in cooking and cleaning. With excellent and durable construction and added space, it is just the grill you need for large parties with friends and family. Just use it with great care to prevent any damages, and it will give best quality cooked food.